« Are you having fun and catching fish? Targeted to catch some smallmouth bass vertical jigging at a place with a lot of potential. Big fish, clear water, and the right kind of bait. However, the wind and extremely cold temps will have made this trip a difficult one to achieve the objective.Nelson joined me on this cold day to venture out in search of big smallmouth bass. We took our time at getting out on the water as it was in the 20’s early morning and it was not warming up too quickly either. Braving the cold we launched with the wind in our faces and wrestled the boat to keep it from smashing against the rocks along the shore. Motoring off we fished a closer spot to avoid a long cold drive. The 1st spot was nice with no wind, the sun in our favor, and calm water to fish. Never fished this spot before but we were all the way north near the inlet from Spoonwood lake. I searched for bait the whole way over to that spot but did not find any. The warm sun and calm water plus my anxiety to fish forced me into just blind fishing this spot. Water temp was about 47 degrees. Winds were a steady north west at about 10 MPH. Water was clear and the sun was bright. After about and hour and a half later I turned to see Nelson with his 6 foot 6 inch spinning rod and 10 pound line bend in half. He was hooting and hollering “yeah baby”. Fish-on for Nelson I went for the video camera and as I did I heard him say, “is that a trout?” Looking over the gunel I corrected him. No, that is a HUGE trout! Wow, what a fish. If we did not catch another fish all day then that would of been fine by him. A net job, quick pic, and back in she went. I would guess that was a 5 pound rainbow trout and about 23+ inches. It as fat too. The pictures did not do that fish justice. It was a tall fat fish. Nuff said. The rest of the day was even colder with a run down the to the south end of the lake. We stopped halfway to fish a ledge but nothing doing and the wind was picking up. Hard to stay off of te ledge safely so we headed all the way down to the south end. Ran from the wind down there too. Fished a few places and did not even get a bite. At one point I found what looked like a whole bunch of fish on the bottom. Dropping my camera down I saw nothing. There were some rocks and weeds which may explain the arches on the bottom. It was snowing with flurries for a while with also some heavy cloud cover made it even colder. Water temp as about 42 down at the south end of the lake. Wind grew more north and was about the same speeds. A stop and go run back up to the north end we were about to leave when I asked Nelson if he wanted to go back to the spot that we were at to start the day and he said yes. 1st cast I banged a smallmouth. Nothing big but a nice bronze color. Nice healthy fish. So while we were outsmarted by weather conditions, the lack of bait, the fish, or even just a bad round of luck today, we still had fun. 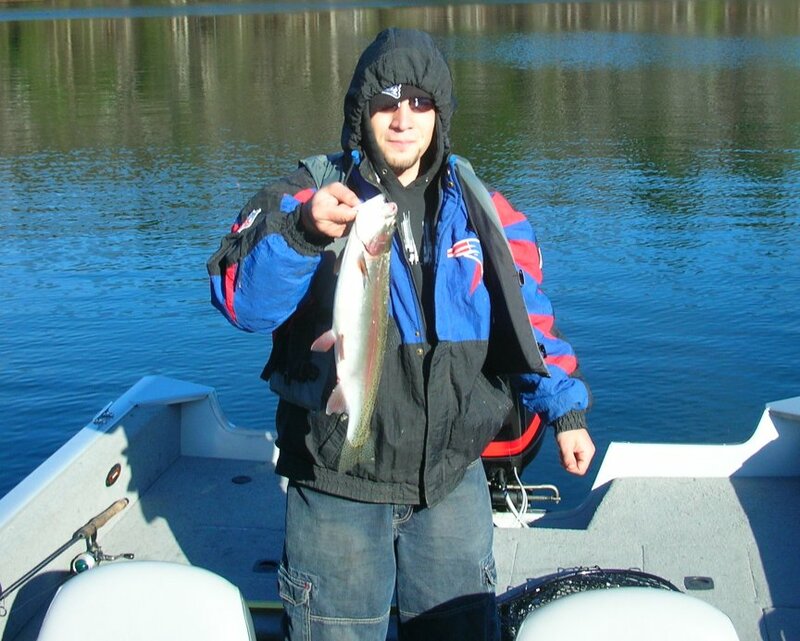 This entry was posted on	November 4, 2006 at 10:09 pm	and is filed under Freshwater Fishing Trips.